After a long (sleepless) night our Chunga gave birth to 5 healthy puppies (4 boys and 1 girl). We are a little tired (especially my husband who was on watch all night and did everything with the birth alone) – we all love him! Here is a picture of the day: Our coton de tulear puppies are 3 weeks old and starting to explore their neighborhood. 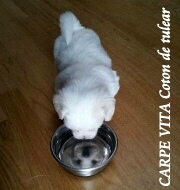 Our Carpe Vita coton de tulear puppies was born. Mony got 2 boys and 2 girls.